Macro needs fairly flat lighting, which can be achieved by diffusion. The diffusion can be achieved by transmission, or reflection. A simple method which combines both, employs a tube of material such as white paper or plastic. This can be copier or tissue paper, yoghurt pot or polystyrene cup. Each will allow different amounts of light to go through, but many materials work. The light can be a very close flash gun, positioned as shown. The tube (shown blue) allows transmission on the same side as the flash, and reflection opposite having been illuminated in the upper part of the tube. Adjusting the height of the flash alters the "fill". You don't have to have any reflected light, it'll bounce around anyway. Note that no light falls directly on the subject. You should find that your flash can be set to a very low power, which will give you a very short flash indeed, freezing all movement. It's still worth using measures such as mirror lockup to avoid movement, otherwise successive exposures may have the subject in different positions - best avoided. Set the fastest shutter speed your camera can use with flash, typically 1/200th or so. Or, if concerned about shutter vibration use very low ambient light, a long shutter (eg 2 seconds) and rear-curtain flash sync. For stacking use manuall flash power not "TTL", and white balance set to flash. I read you, Chris, but I've had confusion as to how to set this up in a horizontal configuration like I'm using. Maybe as simple as swapping out the foiled gum container with a styrofoam cup with an entrance hole in the side for the lens (like I have now for the gum container) and then hit the side with flash with either an opening or no opening in the cup for the flash? 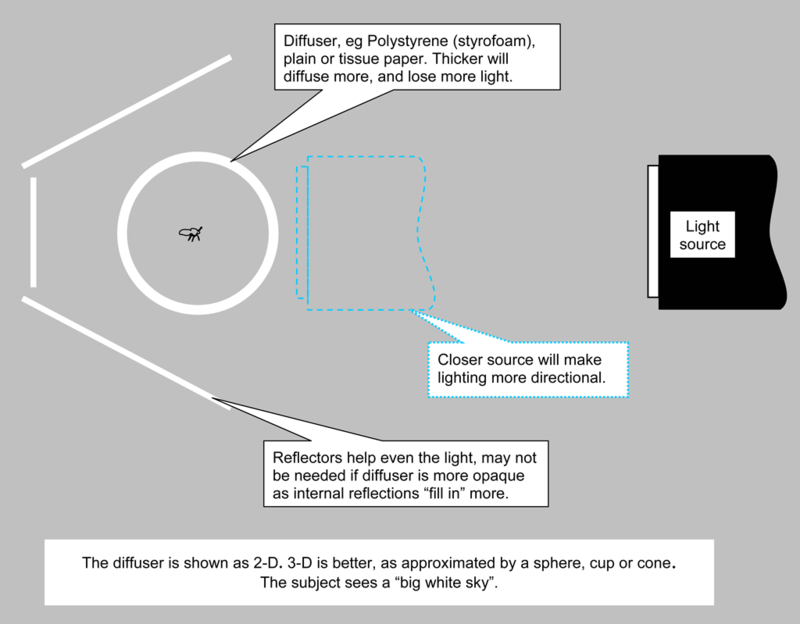 This may help to show princliples for making a single source give more diffuse light.